Thirteen players led by Miss Basketball Whitney Jennings of Logansport have been selected for the 2014 IndyStar.com Indiana Girls All-Stars. A 5-5 guard, Jennings received 177 votes in the Miss Basketball balloting to capture the top individual honor for the state’s girls basketball players. Maura Muensterman of Evansville Mater Dei collected 97 votes to finish as runner-up for Miss Basketball. No other player received more than 10 votes for Miss Basketball. 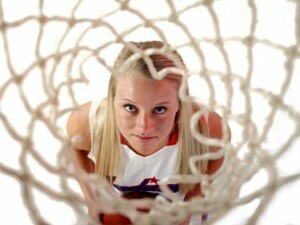 Jennings recently was chosen to the Parade All-America Team as well as the Gatorade Player of the Year for Indiana. The University of Iowa recruit averaged 32.0 points, 8.0 rebounds, 7.4 assists and 5.0 steals as a senior in leading Logansport to a 24-3 record that included North Central Conference, sectional and regional championships. Jennings headlines a 13-member group of senior All-Stars who will play four games in June — two exhibitions against the Indiana Junior All-Stars as well as home-and-home contests against the Kentucky All-Stars. Others chosen to the 2014 Indiana Girls All-Stars are Muensterman, Kayla Brown of Westfield, Sydney Buck of Homestead, Caroline Buhr of Penn, Danielle Cuttino of Ben Davis, Kindell Fincher of Fort Wayne Canterbury, Tayler Goodall of Columbus North, Alex Hochstedler of Fishers, Erica Moore of Mt. Vernon (Fortville), Lauren Whitlatch of Bloomington South and Ana Owens and Destiny Washington of Lawrence North. The head coach for the 2014 Girls All-Stars will be Eric Thornton of Norwell. He will be assisted by Amy Brauman of Brownsburg and Gretchen Miles of Washington. The Indiana Girls All-Stars will play exhibitions on June 9 and June 11 against the Indiana Junior All-Stars at sites to be determined. The Indiana All-Stars also will face the Kentucky All-Stars on June 13 at Transylvania University in Lexington and June 14 at Bankers Life Fieldhouse in Indianapolis. All four dates will be doubleheaders with the Indiana Boys All-Stars. A complete list of those chosen as 2014 IndyStar.com Indiana Girls All-Stars follows.